The Sooners run onto the field for the first time in the 2007 season. Conference play began with a win over the Baylor Bears in Waco, Texas on October 4, and ended with a win over the Missouri Tigers in the Big 12 Championship Game on December 9. The Sooners finished the regular season with a 12-1 record (7-1 in Big 12) while winning their sixth Big 12 title and their 42nd conference title overall. They were invited to the BCS National Championship Game, where they lost to the Florida Gators, 14-24. Oklahoma scored 716 points during the course of their entire season, setting an NCAA Division I record (later broken by Florida State in 2013) for most points scored in a single season. Following the season, Phil Loadholt was selected in the 2nd round of the 2009 NFL Draft, Juaquin Iglesias was drafted in the 3rd, Nic Harris and Duke Robinson were chosen in the 5th, and Manuel Johnson in the 7th. On March 6, 2008, 4-star wide receiver Joshua Jarboe, who was deemed to be one of the recruits who could start playing immediately in the fall, was arrested for receiving stolen property and possessing a weapon at his DeKalb County high school. Jarboe could have faced expulsion under school policy for these felony charges, but did not. Already on thin ice for the weapons possession, he was kicked off the team in June for making a violent rap video on YouTube that described him carrying and using a gun. "Oklahoma 2008 Football Commitments". Rivals.com. Retrieved February 6, 2008. "2008 Oklahoma Commits". Scout.com. Retrieved February 6, 2008. 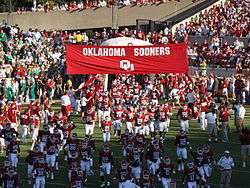 "2008 Player Commitments – Oklahoma". ESPN.com. Retrieved February 6, 2008. "Scout.com Team Recruiting Rankings". Scout.com. Retrieved February 6, 2008. "2008 Team Ranking". Rivals.com. Retrieved February 6, 2008. Prior to the season, several changes were made to the Oklahoma coaching staff. Co-offensive coordinator Kevin Sumlin took the head coaching position at the University of Houston. Defensive coordinator Brent Venables was mentioned as a candidate for the opening at the University of Arkansas before it ultimately went to Bobby Petrino. Offensive Coordinator Kevin Wilson interviewed and was considered a finalist for the opening at the University of Southern Mississippi. That opening ended up going to Wilson's counterpart at Oklahoma State University, Larry Fedora. Bob Stoops, head coach of Oklahoma. Jay Norvell Asst. Offensive Coord. Quarterback Sam Bradford returned for his sophomore year. Oklahoma came into the season ranked #4 in both the Coaches' and AP Poll. In the first game between Chattanooga and Oklahoma, Sam Bradford threw for 183 yards and two touchdowns, and RB Chris Brown ran for three scores. Only an hour-long rainstorm could slow down the Sooners in a 57–2 victory against Chattanooga. The Sooners converted their first seven possessions into touchdowns and led 50–0 before a thunderstorm caused a lightning delay that extended halftime by 1 hour and 12 minutes. UTC, which would go on to earn only one win in the entire season, scored only 2 points on a safety from an errant snap on a punt play. Chattanooga was held to just two first downs the entire game. 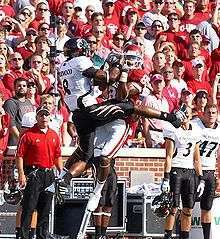 OU's Ryan Broyles and Cincinnati's Brandon Underwood both go up to catch a pass from QB Sam Bradford. Redshirt freshman wide receiver Ryan Broyles, playing his first game as a Sooner, had the most productive receiver debut in school history, with seven catches for 141 yards and a touchdown. Oklahoma gave up a kick return for a touchdown in the third quarter that brought the Bearcats within eight, but OU eventually pulled away from Cincinnati, winning 52–26. On Oklahoma's first drive, QB Sam Bradford threw a 13-yard touchdown pass to Juaquin Iglesias. Oklahoma dominated from then on. Washington scored only twice in the game, losing 55–14. Bradford went 18 of 21 while throwing for 304 yards, five touchdowns and no interceptions. Oklahoma never turned the ball over while Washington fumbled it three times, Oklahoma recovering all three times. TCU had beaten Oklahoma the last two times they had met, the most recent being in 2005, where a #7 ranked Oklahoma was upset by an unranked TCU in the season opener, 10–17. The game started with Sam Bradford throwing two touchdown passes in the first quarter, one to Juaquin Iglesias and the other Manuel Johnson. Johnson ended the game with three touchdowns (all of which were 50+ yard receptions) and 206 receiving yards on just five receptions, becoming the first Oklahoma player to have 200+ receiving yards in a game. This incredible 41.2 yards per catch is still the Sooner YPC game record for players with at least four catches. After three rushing touchdowns by Oklahoma and one through the air put them up 28-0 at the end of the first quarter, Baylor never came within 21. Sooners win, 49–17. This game marked the 103rd meeting of the Red River Rivalry, which has been called one of the greatest sports rivalries. It's the longest active rivalry for the Longhorns, and the second longest for the Sooners, behind only the Bedlam Series. Since 1929, the game has been held at the Cotton Bowl in Dallas, typically in mid-October with the State Fair of Texas occurring adjacent to the stadium. In a high-scoring shootout, Texas upset the Sooners, 45–35. Colt McCoy performed brilliantly in the fourth quarter, leading his team to 15 unanswered points. It was the highest scoring event in the history of rivalry, and it had the highest attendance, a record 92,182. Sam Bradford had 468 yards and three TDs passing in an offensive matchup. After a score of 24–17 at halftime, Oklahoma began to pull away in the third quarter, eventually winning 45–31 in Norman. Oklahoma traveled to Manhattan, Kansas to take on a struggling Kansas State team just coming off a tough road loss to Colorado. The Sooners and Wildcats played a wild first half that saw the two teams combine to score 83 points. The Sooners’ 55 first half points set a school record for most points ever scored before halftime. Oklahoma QB Sam Bradford played what would end up being his worst game of the season, completing only 40 percent of his passes (13–32) for 255 yards. Kansas State QB Josh Freeman had a career-best 478 yards passing, but was sacked twice and had three interceptions against the Sooner defense. When Nebraska walked out under the lights at Memorial Stadium, the Cornhuskers were still in the race for the Big 12 North title, but after the Oklahoma Sooners completed their first drive for a touchdown, intercepted Husker quarterback Joe Ganz's first pass and took it back for an 18-yard touchdown return, then tacked on three more scores, Nebraska's expectations for its bowl season had been lowered considerably. The second quarter went better for the Cornhuskers, backup tailback Roy Helu getting a touchdown and racking up 157 yards on the day, but the Sooner lead proved insurmountable. The Sooners' Sam Bradford stayed in Heisman-race form, throwing for 311 yards and five touchdowns. DeMarco Murray caught a 25-yard scoring pass from Bradford, and ran twice for touchdowns, finishing with 57 rushing yards. Despite the impressive win, the Sooners slipped from 4th to 6th in the BCS rankings. The Sooners scored three touchdowns in the first ten minutes, then never looked back as Sam Bradford passed for four scores to four different receivers and punched one across himself. Chris Brown added three more touchdowns. Aside from the impressive 261 kickoff return yards amassed by Texas A&M running back Cyrus Gray, including a 98-yard return for a touchdown, the hometown Aggie fans had little to cheer about as the Sooners outrushed the Aggies 328–26, and outpassed them 325–252. The Sooner defense frustrated A&M quarterback Jerrod Johnson, sacking him four times and intercepting two of his passes. The win set up a Big 12 showdown against undefeated Texas Tech on November 22, after a bye week. Texas Tech and Oklahoma first played in 1992. Coming into the game, the Sooners led the series 11-4, though the Red Raiders had won 2 of the last 3, with the last loss coming in Norman in 2006. The only road game Tech had won in the series was during the inaugural season of the Big 12 in 1996. 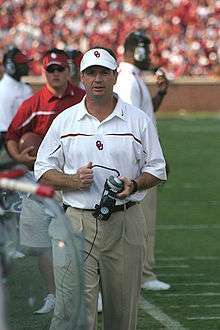 Under head coach Bob Stoops, the Sooners had lost only two games at home. The Sooners were 7-point favorites. The Red Raiders opened the game with a kickoff return to their 32-yard line. The Sooners forced a punt, and fielded their offense at their 27. The Sooners scored a touchdown with 8:59 left in the first. DeMarco Murray contributed 48 rushing yards in the drive. Tech returned the ensuing kickoff to their 22, and a Sooner personal foul after the return gave the Red Raiders 15 yards. Texas Tech lost 10 of those yards due to a delay of game and a false start. Starting at their 27, the Red Raiders were stopped at the Oklahoma 48, where they punted again. The Sooners got the ball on their 20. On the second play of the drive, Oklahoma was punished again with a 15–yard penalty. After three failed attempts to pass the ball for a first down, the Sooners elected to make their first punt. On the next Tech possession, Graham Harrell was sacked on two consecutive plays, once by Adrian Taylor and the other by Gerald McCoy. Coming into the game, the Red Raiders ranked second in the nation in sacks allowed, with only 5. The Sooners ended the first quarter with a 42-yard reception by tight end Jermaine Gresham and two rushes by Chris Brown for a combined 12 yards. Once the second quarter began, both Brown and Gresham moved the ball for a touchdown on three different plays. Tech started their next drive at their own 38 and advanced the ball through the air to eventually get to the Oklahoma 15. Two incompletions caused the Red Raiders to face a 4th and 3. Tech decided to go for it. Running back Shannon Woods was unable to catch a pass by Harrell to convert and Tech turned the ball over on downs. Murray rushed the ball for 23 yards on Oklahoma's first play of the drive. Murray followed with a 31–yard reception, which put the ball on the Tech 30. After two rushes by Brown, Gresham scored a touchdown on a 19-yard catch, and the subsequent extra point extended the Sooners lead to 21–0. Oklahoma's defense forced Tech to four plays on the next drive, with the fourth play being a 4th-and-4, Tech's second 4th down conversion attempt. With 9:31 remaining, Oklahoma completed a scoring drive of under two minutes, which was capped by Juaquin Iglesias' 28–yard scoring reception. On the following possession, the Red Raiders reached the end zone, thanks to Harrell's 25–yard throw to Tramain Swindall. Matt Williams' extra point brought the score to 28–7. With 6:28 left in the half, Oklahoma began to drain the clock using their running game. The Sooners eventually scored on the 12th play of the drive. With just a minute left on the clock, Tech got the ball back. On the second play, Harrell was intercepted by Travis Lewis, who returned the ball 47 yards. Tech offensive guard Brandon Carter, who stopped Lewis at the Tech 1, received a personal foul. Murray scored on a 1–yard rush to increase the Sooners' lead to 35 points. Tech got the ball again after the Sooner touchdown with 18 seconds remaining in the half. Harrell threw a shovel pass to Baron Batch, who ran 21 yards to the Tech 28. The half ended with Tech receiving a 15–yard personal foul. The Red Raiders left the field facing their biggest deficit of the season (35 points). Tech attempted an onside kick to start off the second half, though the Sooners grabbed the ball at the Tech 34. OU ended the next drive on a 33–yard field goal. Tech fumbled on their next possession, and Oklahoma's Keenan Clayton recovered the fumble and returned it 53 yards to the Tech 3. The Sooners added another seven points to extend their lead to 45. Tech cranked up its passing game on its next possession, eventually scoring a touchdown and extra point with 5:39 remaining in the third quarter. On the subsequent drive, the Red Raider defense forced their first sack on QB Sam Bradford, and also forced the Sooners to punt. The Sooner defense countered in the next drive by forcing a three-and-out. The Sooner offense then added another score on a 66-yard reception by Manuel Johnson. The Tech defense blocked the extra point, and the score remained at 58–14. In the fourth quarter, Tech failed to convert another fourth down, giving the ball back to OU. Oklahoma scored immediately afterwards, improving their lead to 51 points. On the next possession, Tech was able to make three pass completions of 10+ yards, though on the final play of the drive, Harrell lost the ball to the Sooners on a sack. With 10:50 left in the game, the Sooners started to run out the clock. The Red Raiders stopped them from scoring on a 4th down from the 1. Tech got the ball back with 4:48 on the clock. After a few plays, Tech faced another 4th down, and this time was able to convert it with a 13–yard throw to Michael Crabtree. Tech later scored their third touchdown with 11 seconds left, and Williams tacked on the extra point to change the score to 65–21. Tech attempted an onside kick and recovered the ball. The final play was a short-yard catch by Woods. Since the Sooners won, Tech, Texas, and OU all tied for first in the division at 6–1. If all three teams won their regular season finales to tie again at 7–1 (which they did), the highest ranked team in the BCS standings would earn a spot in the Big 12 Championship game. Sports columnists had also predicted that the quarterback of the winning team would be the front runner for the Heisman Trophy. The columnists were right. With Oklahoma being the highest ranked team out of the three of them, they advanced to the Big 12 Championship Game, and their QB, Sam Bradford, became the front runner for the Heisman Trophy, eventually winning it. On November 29, 2008, #11 Oklahoma State came into the 103rd Bedlam game ranked the highest they had been coming into the game since the 1984 matchup when they came in at #3, while #3 Oklahoma came in ranked the highest they had been coming into the game since the 2004 game just four years earlier, when they were #2. OSU was trying desperately to break their 5-year Bedlam losing streak and keep one of their best seasons in decades going, while OU was trying to make it into the Big 12 Championship Game, and then possibly the BCS National Championship Game. The first quarter was the lowest scoring of the four; an interception of Oklahoma State junior QB Zac Robinson, a 20-yard TD-rush by Oklahoma sophomore RB DeMarco Murray, then later a 28-yard field goal by OSU sophomore kicker Dan Bailey ended the quarter with OU up 7–3. The second quarter was higher scoring than the first, but still less so than the last two. On a drive that started in the first quarter, the Cowboys scored a TD on a 23-yard pass from QB Robinson to sophomore RB Kendall Hunter. After the kickoff, the Sooners went on a 14 play, 79-yard drive highlighted by a 14-yard run by RB Murray to start off the drive, a 21-yard pass from sophomore QB Sam Bradford to Quentin Chaney, and a 2-yard TD-rush by junior RB Chris Brown to end the drive. This TD drive would mark the first in a line of six TD drives in a row by the Sooners. Following the next kickoff, Oklahoma State went on an 11 play, 39-yard drive to set up another Bailey field goal, this one a 44-yarder, to put the score at 14–13, Oklahoma. Oklahoma scored another TD to finish the half up 21-13. Again, the third quarter was higher scoring than the first two, but not as high as the fourth. OSU started the half with an eight play, 81-yard drive with a 6-yard TD pass from QB Robinson to sophomore WR Dez Bryant to finish it. After the TD, the score was 21–19, and the Cowboys decided to go for two. This turned out to be an ill-fated decision, however, because on the two-point conversion attempt, QB Robinson fumbled the ball, and it was recovered and returned all the way to the other endzone by OU freshman DE Frank Alexander for a safety, putting the Sooners up 23–19. Three plays into the next drive, Oklahoma junior TE Jermaine Gresham scored a TD on a 73-yard pass from QB Bradford. After another TD by each team, the third quarter ended at 37–26, OU. The fourth quarter proved to be the most exciting of the game, as more points were scored in this quarter than the entire first half. The quarter began on an Oklahoma State drive that started in the third quarter. QB Robinson completed a 38-yard pass to senior TE Brandon Pettigrew, and two plays later he completed another pass to WR Bryant for a 17-yard TD. OSU decided to try for another two point conversion, and this time it paid off with Robinson again connecting with Bryant to make the score 37–34, Sooners up by three. The momentum the Cowboys got on those eight points would be short lived, however, as Oklahoma RB Murray returned the following kickoff 68 yards to the Oklahoma State 27-yard line. Six plays later, the last being a one-yard pass from Bradford to junior TE Brody Eldridge for the TD, and OU was again up by 10. But, on the ensuing kickoff, OSU junior KR/CB Perrish Cox ran it back 90 yards for the TD to make the score 44–41 and put the Cowboys within three points again. Unfortunately for Oklahoma State, that would be their final score, as the Sooners would score 17 unanswered points to win the game, 61–41. Oklahoma QB Sam Bradford went 30–44, his second most completions and attempts of his career, but his two TDs tied for his least of the season, and his passer rating of 148.7 was his second worst of the season. Tight end Jermaine Gresham's nine receptions and 158 yards were the most of his career, his two TDs were tied for the second most of his career, and his 71-yard reception was the longest of his career. The combined score of 102 points is the most points ever scored in a Bedlam game. OSU's 41 points were the most they scored in a Bedlam game since the 1998 matchup when they beat Oklahoma, 41–26. This marked the Sooners' 80th win in the Bedlam Series, which was five times as many as Oklahoma State had at the time. The 2009 NFL Draft was held on April 25–26, 2009 at Radio City Music Hall in New York City. The following Oklahoma players were either selected or signed as undrafted free agents following the draft. ↑ Trotter, Jake (February 11, 2008). "Notebook: Stoops Ecstatic About WR Class". The Oklahoman. Retrieved March 7, 2003. ↑ Torres, Kristina (March 7, 2008). "DeKalb Student Athlete Arrested on Weapon Charges". The Atlanta Journal-Constitution. Archived from the original on August 29, 2008. Retrieved March 7, 2008. ↑ "Video: Josh Jarboe is back! This time freestyling!!". GNEXTINC.com. Archived from the original on September 5, 2009. Retrieved August 26, 2008. 1 2 3 4 5 6 7 8 9 10 11 12 13 14 "Seasons 2000s". University of Oklahoma Department of Intercollegiate Athletics. Retrieved October 9, 2012. ↑ Schad, Joe (December 13, 2007). "Source: Houston hires Sumlin, eighth minority coach in FBS". ESPN. Archived from the original on December 14, 2007. Retrieved December 13, 2007. ↑ Neiswanger, Robbie (December 10, 2007). "Razorback Central: Coaching Search Drags On For Arkansas". The Morning News. Springdale, Arkansas. Retrieved October 9, 2012. ↑ MaGee, Patrick (December 10, 2007). "Southern Miss Contacts Oklahoma Coordinator". Hattiesburg American. Retrieved October 9, 2012. ↑ Trotter, Jake (December 10, 2007). "Wilson Will Get His Shot. Icy Weather Prevents Meeting". The Oklahoman. Retrieved October 9, 2012. ↑ "College Buzz: Southern Mississippi Hires Oklahoma State Coordinator Fedora". The Kansas City Star. December 12, 2007. Archived from the original on December 17, 2007. Retrieved October 9, 2012. ↑ Smith, Erick (October 5, 2005). "Full Plate of Big 12, SEC Showdowns Worth Feasting on". USA Today. Retrieved January 17, 2007. ↑ "All Time Record vs. Opponents". MackBrownTexasFootball. Archived from the original on April 26, 2007. Retrieved March 31, 2007. ↑ "Notebook: Reversal of fortunes". Austin American-Statesman. October 8, 2006. Retrieved October 6, 2007. ↑ "Texas Builds on Second-Half Momentum to Drop Oklahoma". ESPN. October 11, 2008. Archived from the original on October 13, 2008. Retrieved October 11, 2008. ↑ "Oklahoma vs Texas Tech football series history". Gnext Inc. Archived from the original on September 5, 2009. Retrieved August 26, 2009. ↑ "Sooners Facts". Lubbock Avalanche-Journal. November 20, 2008. Retrieved November 21, 2008. ↑ Bohls, Kirk (November 22, 2008). "Why Oklahoma Will Beat Tech (or Not". Austin American-Statesman. Retrieved November 22, 2008. ↑ Williams, Don (November 21, 2008). "Leach's Best Team Looks to Make Season Even Better". Lubbock Avalanche Journal. RedRaiders.com. Retrieved November 22, 2008. ↑ "Pass Sacks Allowed - Year: 2008 Thru: 11/15/08". National Collegiate Athletic Association. November 15, 2008. Retrieved December 30, 2008. ↑ "Surging Sooners rout No. 2 Tech 65–21". Google News. Associated Press. November 22, 2008. Retrieved December 30, 2008. ↑ "Sooners dominate Raiders 65-21". Texas Tech University Department of Athletics. November 22, 2008. Archived from the original on January 27, 2009. Retrieved December 30, 2008. ↑ "Oklahoma Pulverizes No. 2 Texas Tech". November 22, 2008. Retrieved December 30, 2008. 1 2 Parrillo, Ray (November 22, 2008). "On College Football: If Texas Tech Slips, Dominoes Will Fall". The Philadelphia Inquirer. Retrieved November 22, 2008. ↑ "College Football: Top 25 Rankings". North County Times. November 21, 2008. Archived from the original on December 5, 2008. Retrieved November 22, 2008. ↑ "Heisman, BCS on Line When Sooners Meet Red Raiders". Google News. Associated Press. November 21, 2008. Retrieved November 22, 2008. ↑ Carlton, Chuck (November 22, 2008). "Everything on the Line for Texas Tech Today". The Dallas Morning News. Retrieved November 22, 2008. 1 2 "Oklahoma vs. Oklahoma State Box Score". ESPN. November 29, 2008. Retrieved September 2, 2013. ↑ "Sam Bradford Game-by-Game Stats". ESPN. Retrieved September 2, 2013. ↑ "Jermaine Gresham Game-by-Game Stats". ESPN. Retrieved September 2, 2013. ↑ "2009 NFL Draft". Pro-Football Reference.com. Retrieved 13 January 2014. Wikimedia Commons has media related to 2008 Oklahoma Sooners football team.